If you’re only buying one bottle of vanilla for cooking, baking, and making cold and creamy desserts, our top choice is a real extract. If you only use vanilla for baking, we have to admit there’s not much difference between a well-made synthetic vanilla and the real thing. Speaking to pastry chefs, we learned that many buy an arsenal of vanilla extracts, using cheaper imitation for baking and pure for confections made with moderate or no heat, such as puddings, pastry cream, and buttercream frosting. If you care about your cooking, why would you skimp on the quality of ingredients? Go for the real stuff. There is a better chance it will turn out well. 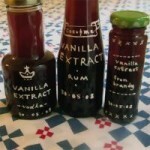 I won’t use anything but my homemade vanilla extract; I know exactly what is in the extract — real vanilla beans and vodka. Vanilla extact has over 250 organic components which gives it the special taste with all of the roundness of flavor. A friend made buttercream frosting for his carrot cake and everyone raved about cake; he realized that it was the homemade vanilla extract, which I had given him, that made the difference. Using my vanilla extract was the only change he had made to his recipe. I completely agree! A good vanilla offers depth and richness to whatever you put it in….it’s totally worth the time involved to find a good one and the extra cost.